Looking at old maps of London from the late middle ages to early modern age, there is only one open space that really catches the eye. West Smithfield was located just outside the city walls. The location was already used as a horse fair and the Kings Friday Market, when a grant was given to establish a priory and hospital in 1123. A royal charter allowed the priory to set up Bartholomew Fair, an annual three-day event. It was the biggest cloth fair in the country in its heyday, and only stopped in 1855 on grounds of debauchery. 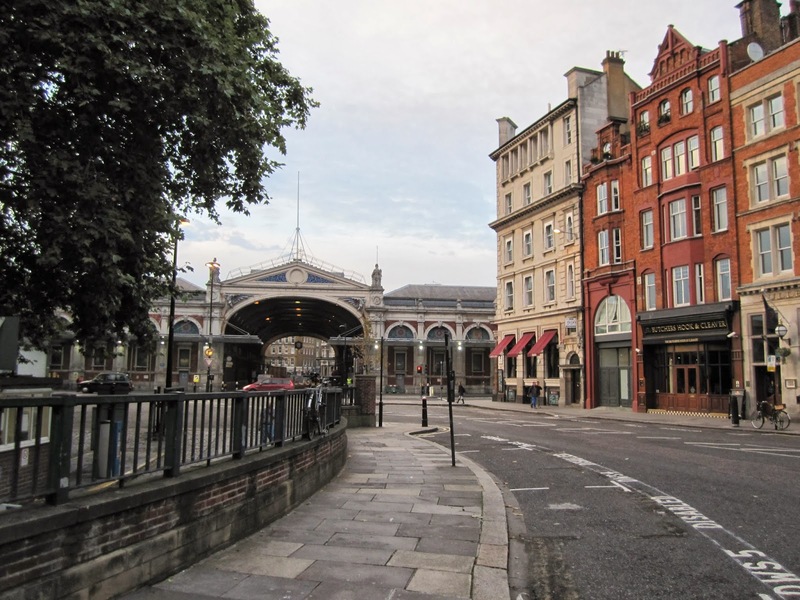 West Smithfield was also used as an execution ground and for tournaments. 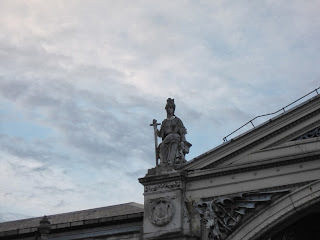 Smithfield was a site for duels and was favoured as a place of torture by theologians. 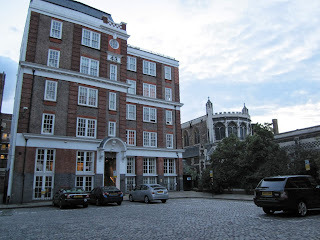 Many people were burnt here: Henry VIII burnt Catholics, Mary burnt Protestants and Elizabeth burnt Anabaptists. St Bartholomew the Great became one of the biggest churches in London, but was seized by the crown in 1539. The nave of the church was demolished and the cleared area was replaced with a churchyard. The demolished space was subdivided into tenements and developed in the early 17th century. Most of the timber-framed houses were demolished in the early 20th century on grounds of public health. The gatehouse built on top of the old church entrance, on the other hand, was stripped of plaster and the timber frames were revealed and restored. 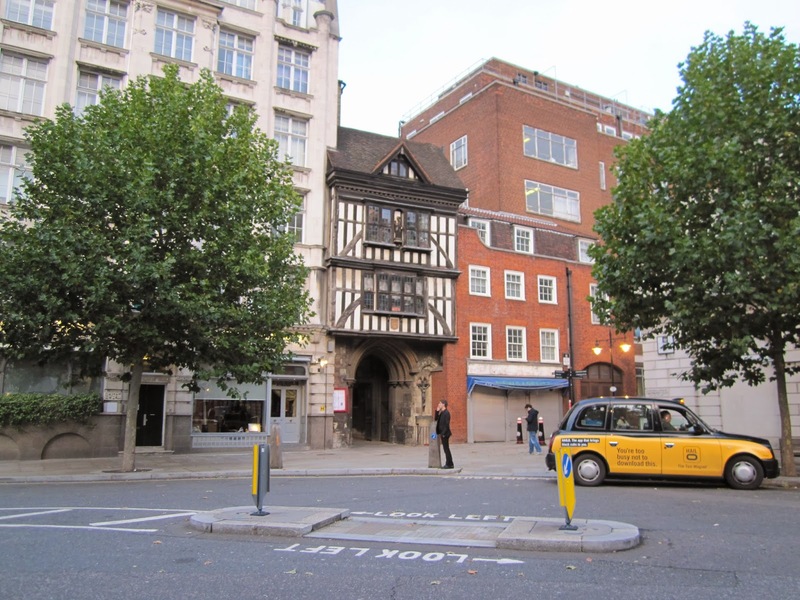 Giltspur Street was formerly known as Knightsriders Streets from the knights riding to the tournaments in West Smithfield. At the back can be seen the dome of Old Bailey (The Central Criminal Court). A formal charter was granted in the 14th for a weekly market. 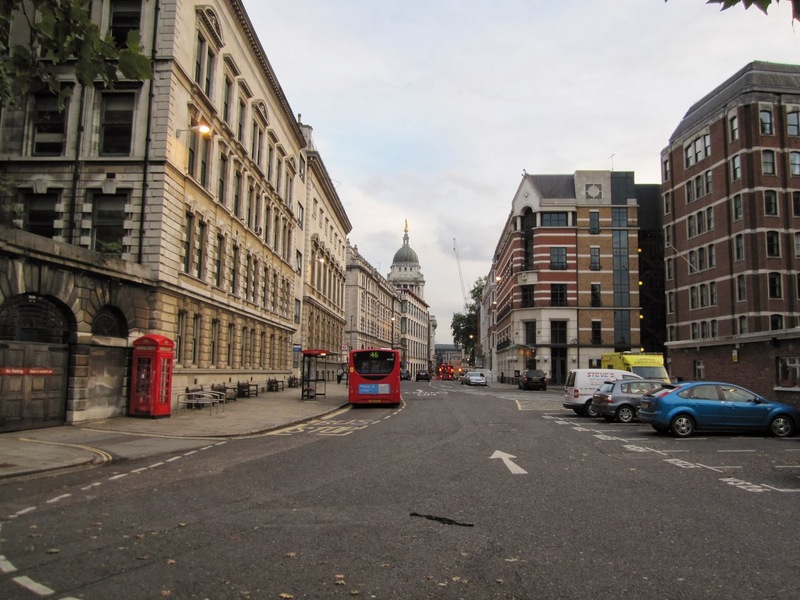 At the same time, the worshipful company of butchers was founded and slaughtering within the city walls was banned. Smithfield consequently developed a market for meat and livestock. A new market building was designed by Horace Jones and construction began in 1866. It was completed two years later, extended in 1873-76 and further annexes were completed in 1888 and 1899. The four statues represent London, Edinburgh, Liverpool and Dublin. Weddel House (left) was increased in height from six to nine storeys just before the Second World War. The other buildings in this view are all Victorian. Number 12 is decorated with an iron shop front with capitals advertising an old pub. Number 11 has giant stone pilasters and spandrels of red brick. Numbers 9-10 is from 1890 and has a flying arch gable linking two dormer windows. The corner building, number 8, has Gothic-Moorish detailing in windows and roofline. 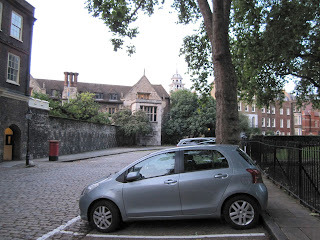 Charterhouse Square was originally the outer precinct of the Charterhouse, a Carthusian priory founded in 1371. The Charterhouse became a private mansion in 1538 after the dissolution of monasteries, and was converted to a hospital in 1611. The former outer precinct remained open ground, and was used as a churchyard. 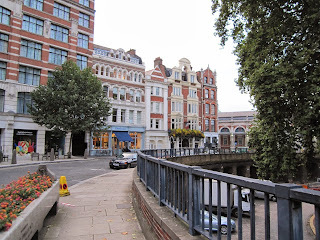 It is usually marked in old maps from before the 18th century as Charterhouse precinct, Charterhouse Yard, Charterhouse Close or Charterhouse Churchyard. 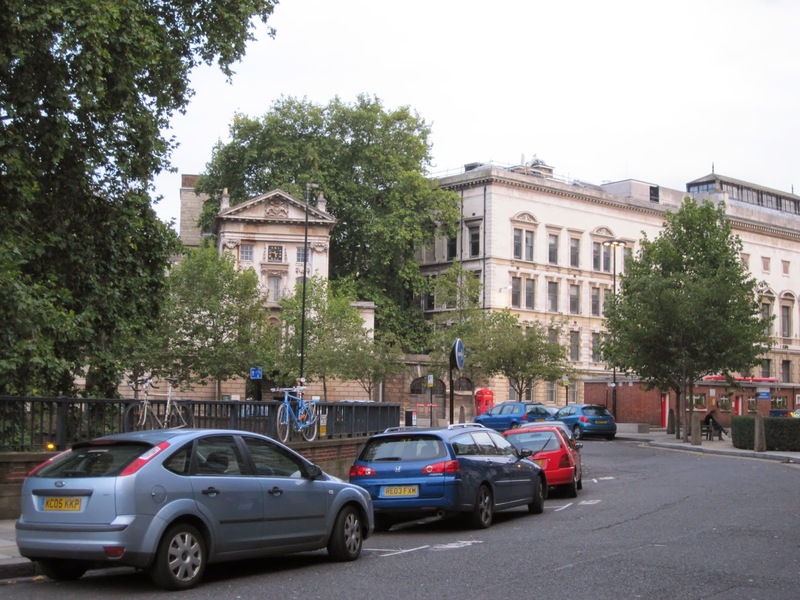 The ownership of the land stayed with the freeholder of the Charterhouse, but the buildings surrounding the yard became fragmented after the dissolution. The area was initially an aristocratic area but was completely redeveloped from 1688 to 1705, and became steadily middle class. The new residents took the initiative to improve the open space, with crossing walks and trees. This was done in 1715 and 1742 and gave the space the look of a typical London West End square. 17 Charterhouse Square was partly built on top of a medieval gateway. It was built in 1716 for the physician to the Charterhouse, Henry Levett and the cost of building was paid by the Charterhouse governors. The front is in brick with red-brick dressings. The doorcase is of timber and is decorated with corinthian pilasters and a segmental pediment. To the left stood two similar houses but these were demolished before the end of the century. 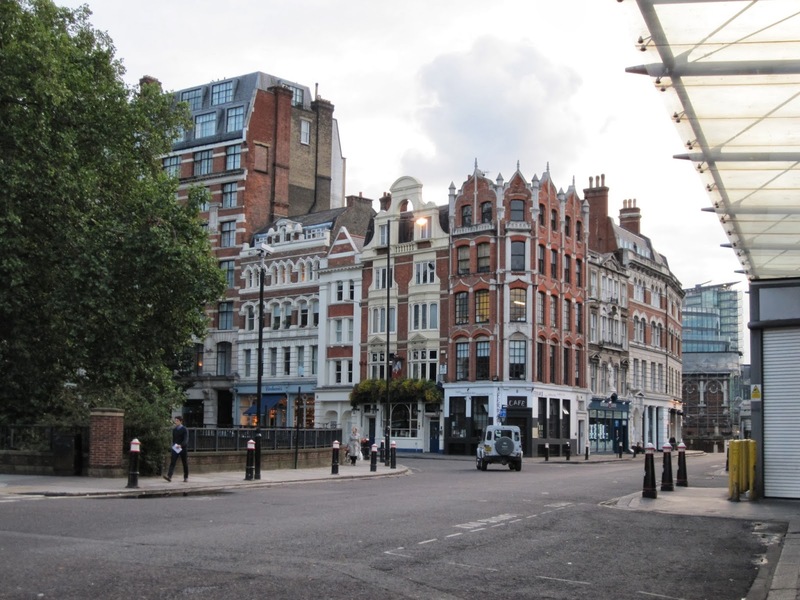 The succeeding houses have also been demolished and the building which stands here today was only completed in 1902, as Charterhouse Hotel. The Charterhouse was converted into a private mansion in 1545 by Edward North. The great hall and chamber were built during this time. The complex was later altered and expanded when it became an almshouse and school after 1611. Most of the houses on the north side of the square were developed in 1810-25; but two of them actually go back to the late 17th century, despite heavy alterations. 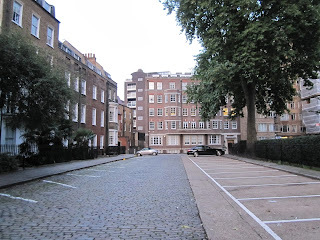 Prior to this period, there was a large mansion in this corner of the square known as Rutland House. The road dividing these houses from the larger building at the back is called Rutland Place and was created in the 1820s. The building was built after the war, despite its mock-Georgian appearance. It was designed by H. C. Wilkerson & Partners in 1957-59. The previous two houses were Georgian in appearance but included some last remaining Tudor elements, such as a fireplace. 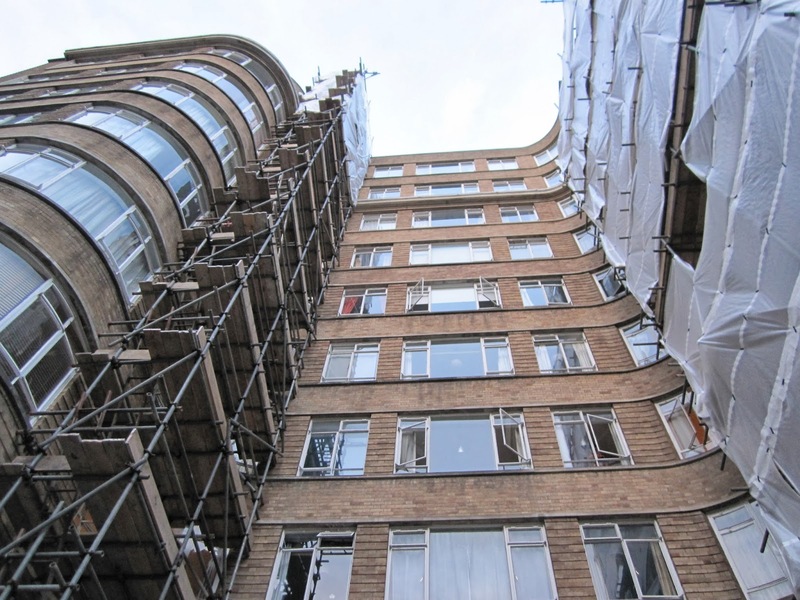 Florin Court was built in 1935-37 as a residential development in the art deco style. The architects were Guy Morgan and Partners. The building has a roof garden and swimming pool in the basement. Bartholomew Close was called Middlesex Court in the 18th century and Little Bartholomew Close in the 19th century. The close is dominated by 43 Bartholomew Close, originally built as a warehouse for Israel & Oppenheimer to a design by Walter Pamphilon. 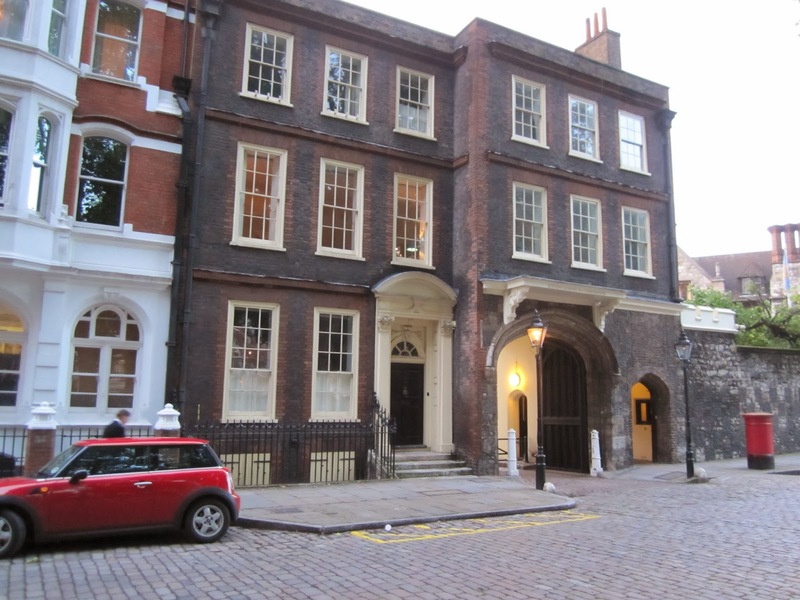 The prior's house was built on this site in 1517 and was later owned by the earl of Middlesex. It was destroyed in a fire in 1830 and replaced with a row of cottages, known as Cockerill's Buildings. These and a few other adjoining buildings were demolished in 1912. On the north side of the Close stood the parochial schools, built in 1888 to the design by Aston Webb. Also visible from the close is the Lady Chapel of Bartholomew the Great. The church appearance is a result of a number of alterations, with walls of mediaeval ragstone rubble, freestone dressings, a brick tower from 1628 and 19th century flint.